Mt Churchill and Mt. Bona, Wrangell - St. Elias National Park. Here’s an image that I am amazingly lucky to have made. Probably luckier than I deserve to be. Not because of the luck involved in catching this scene like this; this image has been a long, long time in coming. 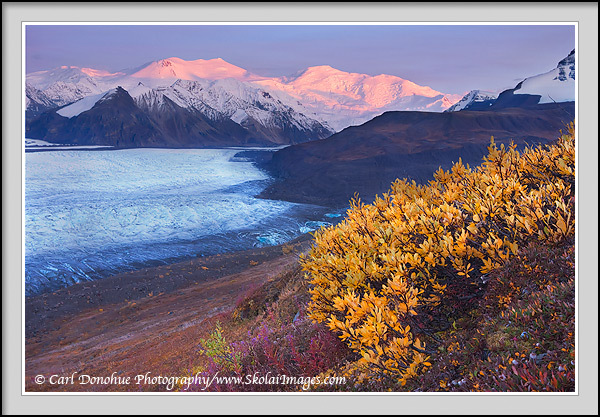 The scene is taken from the south end of Chitistone Pass, near Skolai Pass, Wrangell – St. Elias National Park, Alaska. I’ve spent more time here than I probably should admit to, waiting, hoping and wondering if I’d ever actually happen to catch it in the light that I knew graces these peaks from time to time. Finally, this September, I was up there with our phototour and we were really blessed with some great weather. I was giddy with excitement and I’m sure the folks along on the trip were wondering just what they’d got themselves into. Within 20 minutes of landing we’d already found and photographed a Least Weasel, which I’d never had the opportunity to photograph inside the park previously. Next up we ran into some Woodland caribou, apparently the only woodland caribou herd in Alaska, so that was pretty awesome. Then we saw some Dall sheep rams, and managed to stalk up on them a little. Next up was sunset, and there was gorgeous light in front of us, over the University Mountains, and behind us to the north were some clouds glowing with color. It was way too cool. Until the next morning, when we awoke before the dawn, got up, and started to figure out what we’d shoot when the light came over the distant mountains. I was setting up on a small pond, figuring on a nice reflection, when my camera ceased working. Completely. Nothing would work, so I was outta luck – first morning of a 5 day trip, with perfect light coming my way, in exactly the location I wanted to be, and I had no camera. So Doug Roane saved my a** by loaning me his Canon 40D, and a lens. By evening he was pretty sick and tired of my melancholy self-pity, and decided he’d put a stop to it, by letting me use his wide angle. He’d shoot a few frames, quickly remove his lens and hand it to me, I’d put it on his 40D, shoot a picture, and hand it back to him – time’s precious when the light is fading. So with all thanks to him, I managed to finally make my photo I’d been wanting for a long, long time. Mt Churchill, Mt. Bona, the Russell Glacier, alpenglow and some fall color to boot. Like I said, luckier than I deserve. Earlier in the day a few of us hiked out on to that flat plateau you see in the middleground, behind the willow bush. So now I’ve got another image in mind that I want, so I guess that means I have to make yet another trip to Skolai Pass. I tell ya, there’s no rest for the wicked. I just hope next time my camera works OK – either that or Doug comes along. A friend asked me once if I thought a backup camera was necessary, and I paraphrased another good friend of mine in reply: “No, you don’t need a backup camera. You just need to make sure you hike with someone else who carries a backup camera”. Sage advice. Stunning image Carl. Love the complimentary colors and foreground/background flow. Just super. Great story and great image Carl. Perfect light, I can see why you were drooling. Perhaps you ought to think about starting camera caches around Alaska. Thanks a lot, I appreciate the comments. Mark, that’s a great idea, “camera caches”. I might give it a try. care to send me that D700 and I’ll store it in a safe place?